As much as we love the Great Lakes, time has come to move on. We came here in 2009 with the intention of only staying a few months. Little did we know that the spectacular North Channel and the lovely ports along the shores of Lake Michigan would quickly lure us into staying longer. We ended up spending four summers exploring this wonderful cruising area. After two seasons in the North Channel, last year in Lake Superior, and this season exploring northern Lake Michigan we have gotten to know the lakes well. The weather on these huge bodies of water can be quite a challenge. We have had both good and bad days and have learned to respect these lakes. We have met so many wonderful people and made many new friends while here. Lake Michigan now feels like home to us and it is with a touch of sadness that we begin our journey south. We have been ready to head south now for the past week but Lake Michigan had different plans for us. The winds continued to howl from the south with 6-9 foot seas for an entire week. Lake Michigan will let us go when she is ready. The seas today are forecast to be 2-4 ft. Normally we would not go with this forecast but today and tomorrow look to be our only hopes of getting off the lake. After tomorrow the winds again pick up to gale force for the next week. After studying several different forecasts we decide to give it a try. We don’t see the winds being as strong as predicted but we do have several bail out options if the lake gets too nasty. It is still dark as we pull out of our slip at North Shore Marina. Idyll Time doesn’t want to leave and gives one last effort to stay. As Jeff puts the throttle in reverse, she doesn’t budge. Her keel is stuck in the mud! Because of the lack of rain, the lakes are two feet below normal and our slip barely deep enough for us. With a little encouragement from her engine she relents and starts inching backwards. Outside the breakwater, we are relieved to find the seas have calmed down and are only about 1 foot. We have a smooth trip and are entering the South Haven breakwaters at 11:00 AM. Glad we arrived early as the winds and seas did pick up this afternoon. Another looper, Jim and Joy aboard Jim’s Joy, arrive a few hours later and had a much rougher trip. Jim and Joy had also been at North Shore Marina for the past week getting some work done on their boat and were also anxious to get off the lake. We will travel with them for the next few days. South Haven is a very nice town and we enjoy peeking in some of the shops. This afternoon we found a great bike path and were able to get in a 20 mile ride on the Kal-Haven trail. This old railroad bed is now a linear state park and extends 35 miles from South Haven to Kalazamoo. The hard packed cinder path takes us along the Black River and through corn fields ready for harvest. It is a beautiful ride. 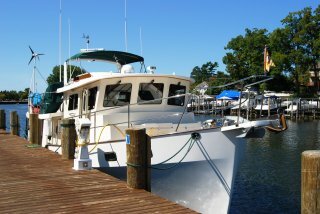 Tomorrow is another long day on the water so we are to bed early. It is still dark as we exit the South Haven breakwater. Jim’s Joy follows just behind us. We have a route plotted which takes us offshore directly to Hammond, IN. The winds and seas continue to build so we change course and run closer to shore. This adds about an hour to our trip but makes for a much smoother ride. 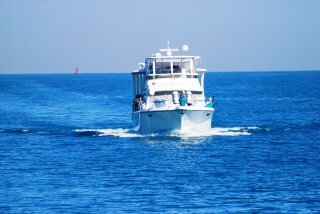 By afternoon the seas have calmed down and we are able to resume our direct route. Our last few hours on Lake Michigan are very enjoyable with less than one foot seas. Our stop for tonight is at the Hammond Marina, 10 miles east of downtown Chicago. We enjoy a good dinner buffet at the casino next door with Jim and Joy. Lake Michigan was very kind to us today as we say goodbye to her. Tomorrow we will start our long trip down the Illinois, Ohio, Mississippi, and Tennessee Rivers. With the Mississippi at historical low levels due to the drought, our trip will be challenging. In addition to dealing with all the barge traffic, these low water levels will make finding anchorages and marinas very difficult. We approach this trip with much anticipation yet many unknowns. This entry was posted on September 19, 2012 at 11:06 pm. You can follow any responses to this entry through the RSS 2.0 feed. You can leave a response, or trackback from your own site. 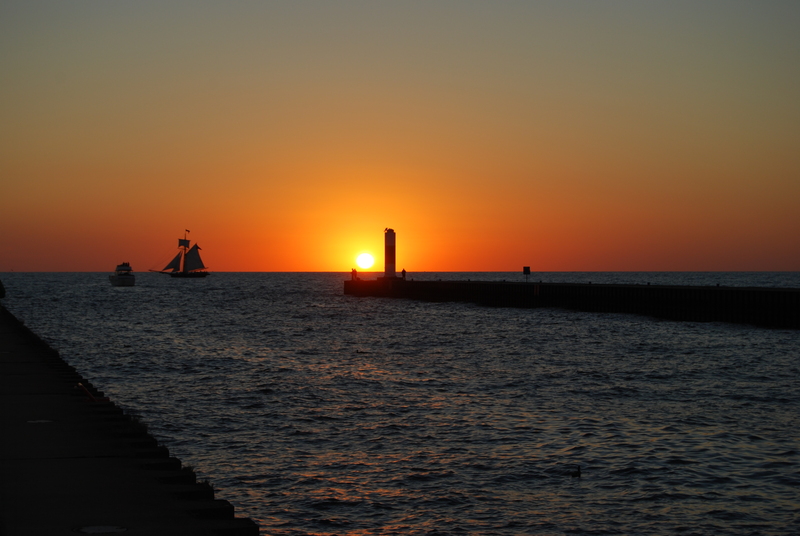 2 Responses to "Final Days on Lake Michigan"
Thank you for the great blog posts. Living in northern Indiana and spending a lot of wonderful days on and around Lake Michigan, we have enjoyed many of the same places and ports that you have written about. We will continue to follow your blog as we too wish to complete the loop someday. Until our wakes cross, we wish you fair skies and clam seas. We are sorry our paths did not cross this summer. Just looked at our GPS trip meter and it reads over 1900 miles…so as you know we were never at the marina! Hopefully only three years till our Loop trip, so we hope to see you in Chatanooga then. But if your RV or boat trips ever bring you this way, please call! Good luck with the water levels (and all else) as you make the trip home after almost four years enjoying our great boating state. It was always a pleasure chatting with both of you.